I’ve been pretty much living on this smoothie lately since my Crohn’s disease is flaring up. 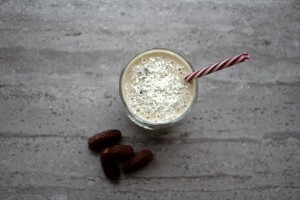 It’s been hard to face big meals due to massive amounts of nausea so smoothies are a great way to bulk up on calories. This is easy on the tummy and so delicious too! I use a premium coconut milk with absolutely no additives. The only ingredient is 100% coconut milk. It is expensive compared to the stuff in the supermarket but so worth the extra price. Luckily, we found a local Asian wholesaler who sells to the public so at least we can buy this is bulk for a small discount. I use this coconut milk in smoothies, curries and even in soups. You can keep the leftover coconut milk in the fridge in an airtight container and it should be used within 1-2 days. A delicious and healthy dairy-free smoothie packed with goodness. 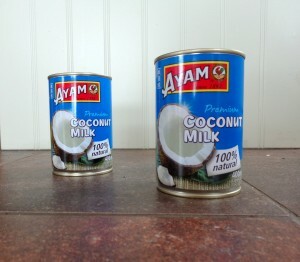 1 cup (240ml) Coconut milk* *No additives. See photo above. 10 Organic small dates*, halved and pitted *If you are using Medjool dates then 5-6 would be enough. Place the coconut milk, ripe banana and dates in a powerful blender and leave to soak for up to 30 minutes. This will make the dates blend better. Add the ice and blend to desired consistency.